1. How many projects can we realistically target given our resource limitations (big picture)? 2. What resource bottlenecks are approaching that could negatively impact our project workflow? PD-Trak helps answer these questions by providing real time resource data on our projects and an analysis tool that allows us to compare resource demand vs. availability, in the long term (allowing us to avoid project overload) and the short term (allowing us to plan around upcoming bottlenecks). The project level pages in PD-Trak support evolving granularity of data capture. In the early stages of a project, a broad-brush resource allocation can be made, allocating resources types to the project and capturing approximate headcount by stage/phase. As the project progresses, a more detailed resource demand profile can be captured, either by resource type or by resource name, on a weekly timescale. 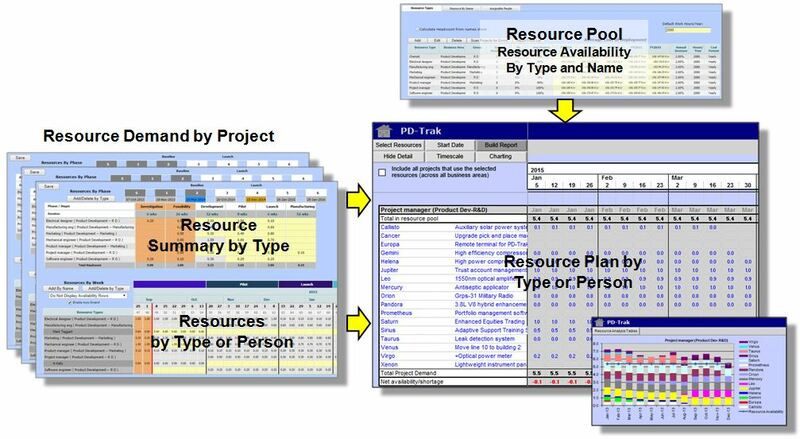 This approach has been developed over many years, working with companies that have struggled to use Microsoft Project® for centralized resource management, but have concluded that the effort to keep detailed Gantt Charts on all projects current at all times is not worth the effort/investment. The Resource Analysis report compares the rolled up demand from the projects to availability from a central resource pool, and displays the results in both tabular and graphical format. (Note: PD-Trak does support the use of Microsoft Project® for detailed task planning and critical path analysis).